Experience One of Life’s Greatest Adventures! 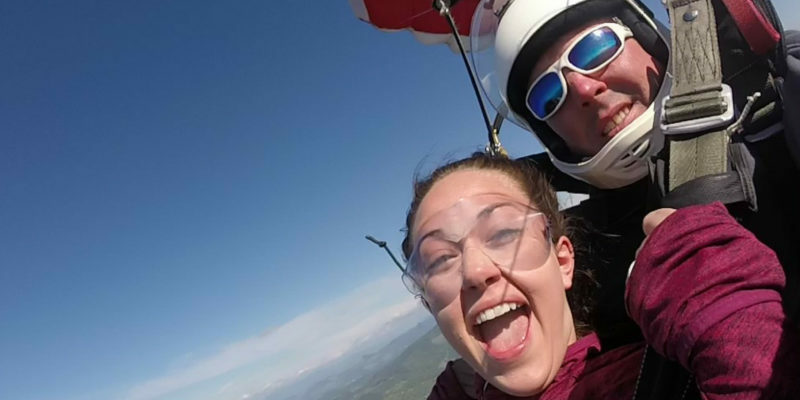 A tandem skydive is a fun-filled experience that you will never forget! During a tandem skydive jump, the student is harnessed to a parachute and instructor who supports and guides them throughout the jump. Tandem students are trained and ready to jump in about an hour! At Eugene Skydivers, your tandem skydiving experience will begin with a brief group training session. Following group training, we will pair you up with one of our expert tandem instructors for a more detailed, one-on-one training. Your tandem instructor will walk you through a step-by-step description of your skydive and help you ‘gear up’ for your jump. Once you are geared up, you will board the aircraft with your instructor and begin your climb to altitude. The ride to altitude will take about 20 minutes and you’ll be able to take in beautiful views of the Southern Willamette Valley. Once you reach altitude, you will exit the aircraft sharing a parachute with your instructor, and experience approximately 50 seconds of freefall. At the appropriate time, your instructor will deploy the parachute where you will enjoy a peaceful, 3-4 minute canopy ride that will carry you to a soft landing back at the dropzone. 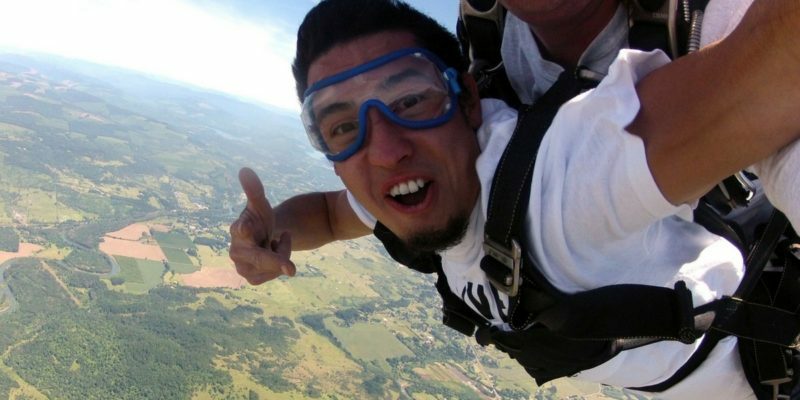 Tandem skydiving from two miles high in the sky above the southern Willamette Valley will be one of the most exciting experiences of your life! 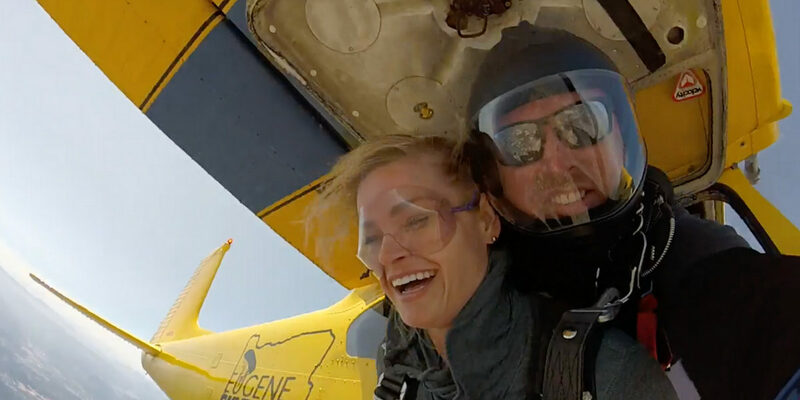 Eugene Skydivers tandem skydiving video services offer high-quality video & photo packages so you can document this day and share it with family and friends. Our professionals use high-resolution cameras to capture everything from the pre-jump briefing, to gear up, to the airplane flight. 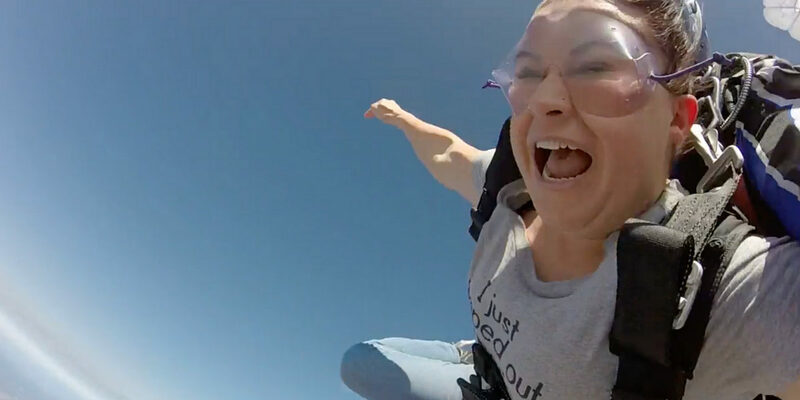 We keep the cameras rolling as you jump out, freefall through the sky, and fly your parachute to the landing. 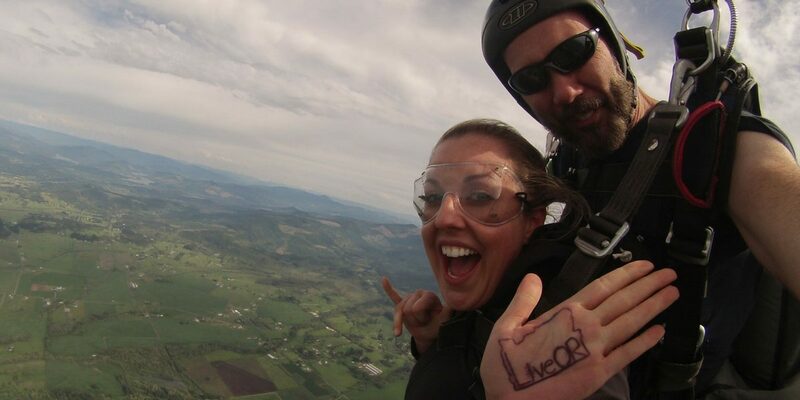 You only make your first jump once in your life – get the video and photos of your skydive at Eugene Skydivers! 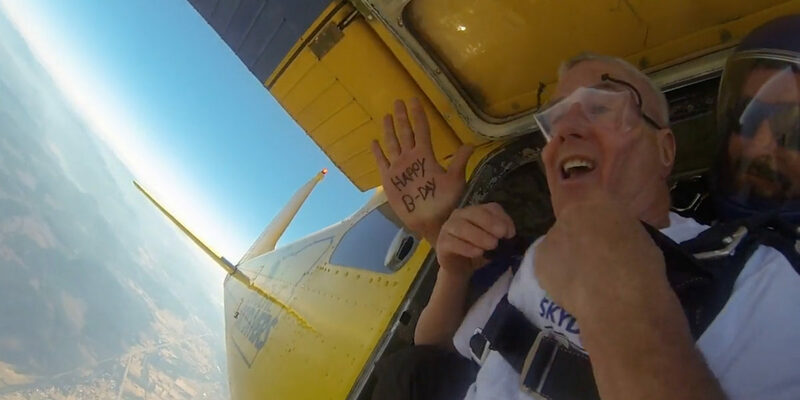 A link will be delivered straight to your inbox so you can easily view, download and share your skydiving pictures and video with all your friends and family. Guests wishing to receive their media on a DVD or USB can request an upgrade at the office on the day of their jump.